Processing time is 1–15 business days. The use of Astro, Alpha, TT15, T 5, and DC 50 mini devices is subject to licensing requirements often vary depending on the country in which the product is used. For detailed information, see www.garmin.com/tracking-legal or contact your local store Garmin or a Garmin dealer Astro and Alpha. The use of radio frequencies used for communications product models Astro, Alpha, TT15, T 5, and DC 50 mini US is not authorized in Europe. To ensure compliance with local laws, the radio function that allows products dog collars US.UU. communicate with the handheld device will not be available when these products are used in Europe. It tracks up to 20 perros¹ at once, with distances up to 14.5 km using the collar device T 5 Garmin or up to 6.4 km with collar device T 5 Mini. The refresh rate 2.5 seconds provides a faster track location when the dogs are moving. GPS / GLONASS reception for better satellite tracking in demanding environments and a dual battery. With advanced security features such as geofences and rescue mode. Advanced data on your dogs help analyze patterns and behaviors hunting each of your dogs, see the distance, time and more. With faster location updates 2.5 seconds and the ability to track up to 20 dogs , Alpha 50 is the dog tracking system for handheld devices of new generation. Intuitive and easy to use, the handheld Alpha 50 incorporates a color screen of 2.6 inches, an optional built -in rechargeable battery, geofences and advanced data to help analyze the habits track your dog in the field, so that you can learn to train them more effectively.Alpha 50 can be used with other Alpha 50 and Alpha 100 devices to track dog collars simultaneously. Note: once the dog collars have been configured to support Alpha devices, the Astro 320 can not track them simultaneously. By using collars T 5 or T 5 Mini Garmin 2 (available in pack or separately) to transmit the location of each dog every 2.5 seconds, Alpha 50 rapidly determines the path you are following even when they are moving. From Alpha screen, you can see the current location of your dog and a trail of where you’ve been.You can also switch to the Dog Tracking page to view a compass pointing the location of your dog. To help keep the overall situation in sight when several dogs tracking is performed, the automatic zoom lets you zoom in or zoom out easily map inorder to see all the dogs on the screen at any time. Dogs that are too far apart to fit on the current zoom scale of the map can be marked on the side of the screen, in the direction of the location of the dog. To reduce visual clutter on the map, you can switch between “show all”, “show some” and “do not show any”, and choose how long will be visible track each dog on the screen. You can also share the code tracking a dog so that someone else can see that dog’s location on the map of your unit, along with compass tracking dogs. In addition, code sharing control of a dog, you can allow another person to configure and control the device from your dog ‘s collar. 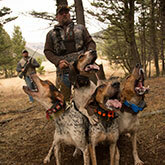 Sophisticated hunting metrics help control hunting patterns and behaviors your dog to optimize your training opportunities. You can see the time, distance and overall scores of your dog. In addition, the Alpha 50 also captures the number of times in which an event “on sample” or “cornered prey” during hunting indicated. Alpha 50 incorporates a microSD ™ slot that allows you to load even more mapping options, such as cards TOPO or BirdsEye Select (sold separately). You can also choose map data City Navigator® NT that provide you directions of rotation turn road driving. In addition, Alpha 50 is compatible with satellite images BirdsEye(with one year free subscription included), so you can download satellite images to your device and integrate them with your maps. Alpha maps show relevant nearby geographic features and let you know if your dog has crossed a river or near a dangerous road. Alpha 50 also supports custom Garmin Maps , free software that transforms paper and electronic maps into downloadable maps on the device. With a broad ecosystem of wireless connectivity options, Alpha 50 can support data transfer from unit to unit with a variety of compatible Garmin devices. For example, the GPS Navigator Garmin DriveTrack ™ 70LM can receive and display the positions of the dogs in their moving map, with views of TOPO or satellite imagery showing navigation instructions to the current location of your dog. Also, GPS watches fēnix® 3 can receive updates and status alerts dog that are available at a glance on the wrist. Also, when you’re in the field, Alpha 50 allows you to connect and wirelessly share the details of the dog with devices with ANT + ® compatible friends, to help coordinate the logistics of hunting on the fly. Once located the quarry, mark the exact spot with the Covey Counter ™ function Alpha device, a special waypoint that shows the exact values ​​of the location, time of day and the height of the place where the dam was found and as the number of birds attracted and captured at that location. Alpha lets you save other special waypoints, such as “Truck” and “Shelter”, so you can re-find your way to these locations easily at the end of the hunt. Alpha also offers special waypoint icons to represent food bowls, tree platforms and other hunting-related points. Planifícate for a hunting session more productive with the software BaseCamp ™, which lets you view and organize maps, waypoints, routes and tracks. This planning software even lets you create free travel Garmin Adventures you can share with friends, family or fellow explorers. BaseCamp displays topographic map data in 2D or 3D on the computer screen, including height profiles and bathymetric lines. You can also download a huge amount of satellite images to your device by connecting it with the free 1 – year subscription to satellite images Birdseye Alpha. BaseStation load the software on your laptop to turn it into a control center field to track multiple dogs (equipped with devices for dogs T 5 or T 5 Mini 2 ). 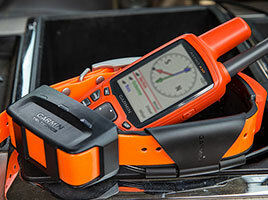 Receive information by GPS in real time on the screen of your computer, making it ideal for search and rescue dogs. And because of that works with GPS / GLONASS, receive tracking information even when Internet and mobile phone service are not available. Like all Garmin outdoor products, Alpha 50 is designed to be effective, easy to use, reliable and durable enough to withstand all the bumps, potholes and muddy conditions of training and hunting. The handheld device is waterproof IPX7 under , and can be operated with standard AA batteries. It is also available optionally with a NiMH battery pack that can be recharged from the device. In addition, if it ever falls or Alpha 50 device is lost in the field, its high visibility orange case facilitates its location. 1 Devices for additional dogs required (sold separately) 2 Alpha 50 is also compatible with devices for dogs and TT TT ™ 15 ™ 15 Mini (for monitoring only). DC 50 requires a software update.